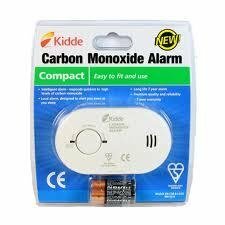 The Kidde KS901 is a battery-operated carbon monoxide (CO) alarm, and has the patented Nighthawk electrochemical CO sensor to help protect you and your family from the dangers of CO. 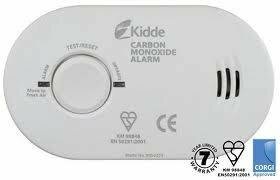 When the Kidde KS901 unit is operating properly and hazardous CO levels are not detected, its green LED flashes every 30 seconds. In a CO emergency, the red LED pulses and an 85 db horn sounds at specific intervals until the CO threat is eliminated. Because it's powered by AA batteries, the KS901 is able to provide continuous monitoring of CO levels, even during power outages. And the unit has an alarm that tells you when the batteries need to be replaced. For peace of mind, a test / reset button allows you to test that alarm is functioning properly. Plus, the KS901 is equipped with a peak-level memory that keeps track of the maximum CO level detected between resets. The KS901 is covered with a five-year manufacturer's limited warranty and replacement is recommended after seven years. Kidde is a leading manufacturer of advanced fire protection equipment, comprising some of the best known and most trusted brands in the fire industry. Its products range from the latest fire detection and alarm technology, through engineered fire suppression systems, to hand-held fire fighting equipment.